Waves of Creativity: Shabby Chic? I spotted a strip of corrugated card and decided to go for a shabby chic hanging with browns and blues for my next Poinsettia project for the ONE STAMP event. 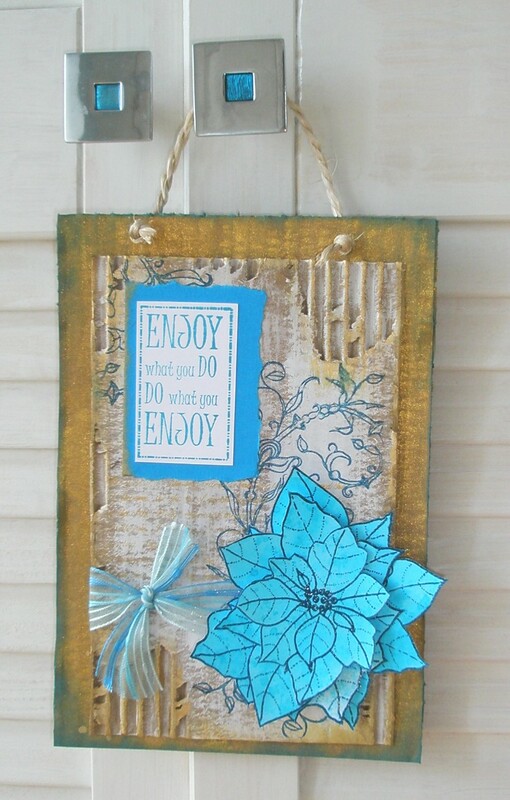 I've used Glorious Gold Ink in a Bottle and white and gold acrylic paint for the bases and various stamps on this - the Enjoy What You Do stamped in Sea Green Pigment Ink, the Walesby Flourish stamped in Midnight Pigment Ink and the Winter Garden Text stamped with gold acrylic paint. Obviously I've used the large Poinsettia stamp inked with Midnight Pigment Ink on card sprayed with Totally Turquoise Ink in a Bottle.